Aigle Parcours 2 Trophee Wellington Boots. One of the newest additions to the Parcours range, the Trophee features an adjustable gusset on the calf with polyester lined upper and full grain leather foot lining. Parcours Trophée are anti-fatigue boots with reinforcements at the front of the foot, these are the perfect boots for moving through the brambles and branches. Made from fencing fabric, a high tenacity polyester, this reinforcement is located in the forefoot and has been tested according to standard NF EN 13567+A1** to ensure maximum protection. 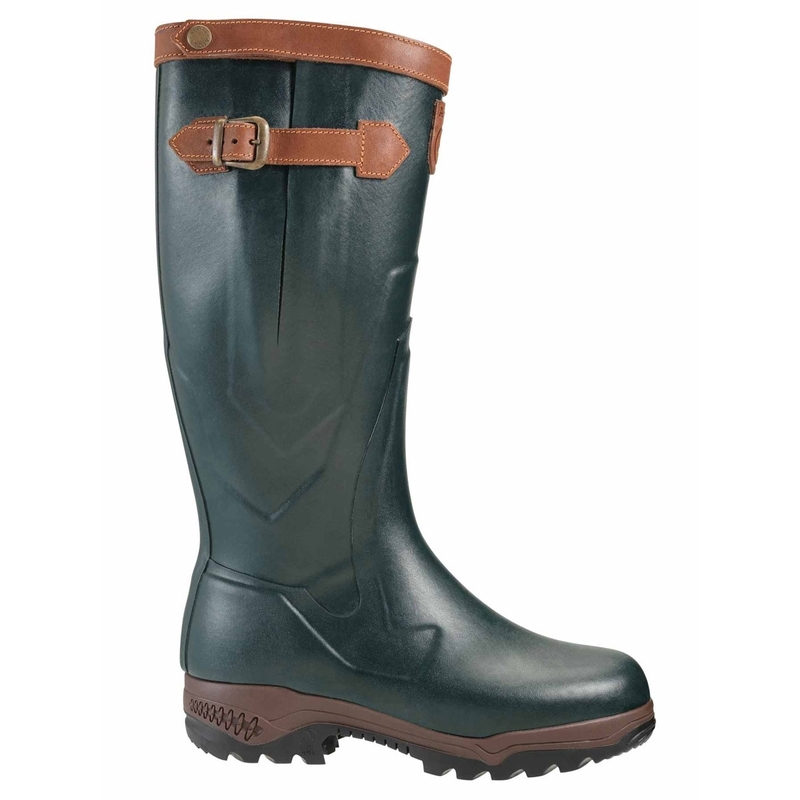 The lining around the foot and on the sole are full grain leather which offers great comfort and excellent insulation. Leather regulates perspiration and prevents overheating when walking over long periods.The top of the boot is itself lined in polyester, it dries quickly. With their tri-density rubber soles, Parcours boots offer comfort, allowing you to walk further without getting tired. The damping cushions in the heels act as return springs, resituating part of the energy used in taking a step. The leather lining means warm feet my wife always has cold feet but these are on the verge of making them sweat if your partner suffers with the cold then buy her these. Great pair of boots very generous in size (particularly the width of the boot). Very comfortable! Very comfortable and feel robust so hopefully will be long lasting. I've worn Aigle wellies for the past 25 years. However, these leather lined ones are simply incredible. The ease of putting them on, the comfort, they last forever, and keep your feet extremely warm, even in ice and snow. Far better than the neoprene lined ones.&nbsp;I've tried all the best brands and I now wouldn't buy anything but these. Cool in summer, warm in winter, so comfy and support your foot so you can walk for hours in glorious comfort. Highest recommendation.